Buy Diamond Earrings – Get Everything You Need to Know Here! Picture this, you (or your woman) wearing a beautiful, black velvet dress with a low cut V shaped neckline, tight bodice, and a long flowing skirt. Your neck is adorned with a multiple strand necklace glittering like magic fairy dust, and you have nothing for your ears!!! Quite a fantasy turned nightmare don’t you think? That’s the importance of earrings, and what speaks more splendor than a pair of DIAMOND stud earrings! In this site, you will learn all anyone can teach you in different types of ooo-ahh getters (or subtle, heart felt beauties if that’s your preference), along with the ability to make smart investment decisions for when the time comes. 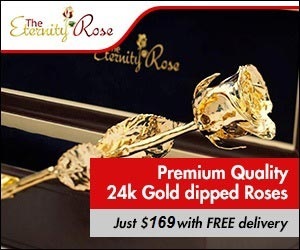 From the sheer glamor of hoop diamond earrings to the practicality of everyday gold earrings, you will learn the basic fundamentals necessary to separate a good diamond from a bad one, a real diamond from a fake one, and all styles of earring design grouped into major categories for your convenience. 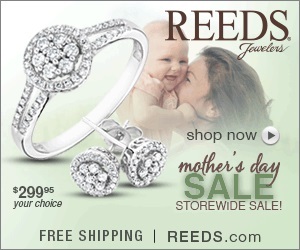 And don’t feel left out if you are a man (or woman) shopping for men’s diamond earrings. We will cover those grounds too! So read on my friend, there’s a wealth of information just waiting for you to dig in. 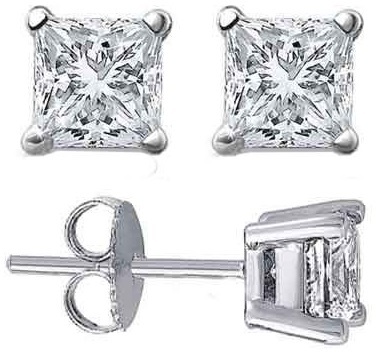 Diamond stud earrings are a must have for any woman’s jewelry collection. The most popular setting for diamond stud earrings is a four prong setting in 14k or 18k gold. The size of the diamond usually ranges from .25 carat to 2 carats each. Accordingly, the price can vary from $200 on up. If you find a lower price, be sure to check the color and clarity to be sure its a real and genuine diamond, not fake diamonds. Diamond stud earrings are available in screw back and friction back. The “back” is the part of the earring that secures the back of the ear to the post of the earring. A screw back secures to a threaded post by turning the screw back onto the post. This is the most secure backing for diamond stud earrings and is preferred for expensive earrings, earrings that are not removed often, and children for additional security. The downside is that a screw back is inconvenient compared to a friction back. A friction back just slides onto the earring’s post and clicks into a little groove. This type of backing makes it very easy to wear and remove. Friction backs are suggested for everyday earrings. Now that you had a basic understanding of the different earring designs, I hope this helps you towards your final selection process. If you have any questions, feel free to message me.